In ancient times, there were large columns in Ua Pou. One day, a column arrived from Hiva Oa named Matafenua. This latter had fought against the columns of Ua Pou and had beaten all of them. They had all fallen, their dead-bodies became the mountains separating the valleys. One day a new column – named Poumaka was born in Ua Pou. While going all around the island, he realized that the dead columns were lying everywhere. Poumaka asked: “Who killed these columns?”, and someone answered him: “It is Matafenua”. When Poumaka had grown up and had become a warrior, he joined Hiva Oa to get his revenge. Informed of his arrival, Matafenua was frightened and took refuge in the East of Hiva Oa. Poumaka went to war and initially pursued and killed the Kiukiu column. His body fell and laid down in the West of Hiva Oa. Then Poumaka went after Matafenua and found him in the East of Hiva Oa. He knocked him down and cut off his head which he attached to his loincloth to bring it back to Ua Pou. Thus, you will be able to see a hill near the Poumaka peak which is the head of Matafenua. 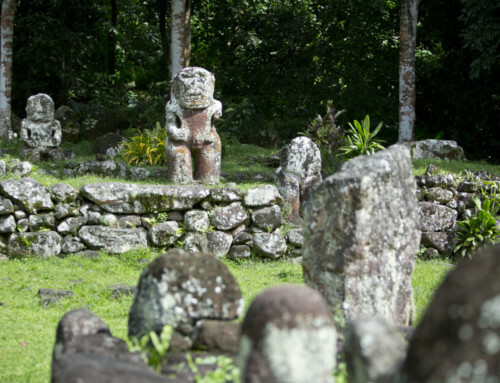 As for his body, it still lies in the East of Hiva Oa.